This unusual recipe teams pasta and a basic butter, cheese and garlic sauce with a hint of green tea. This interesting fusion recipe certainly makes a change from spaghetti Bolognese or carbonara, and you will be surprised how well the delicate matcha flavour complements the other ingredients. Add some chicken or shrimp to the dish (your leftovers from the previous day could be handy here) or, for a vegetarian alternative, some steamed vegetables such as mushrooms or asparagus. 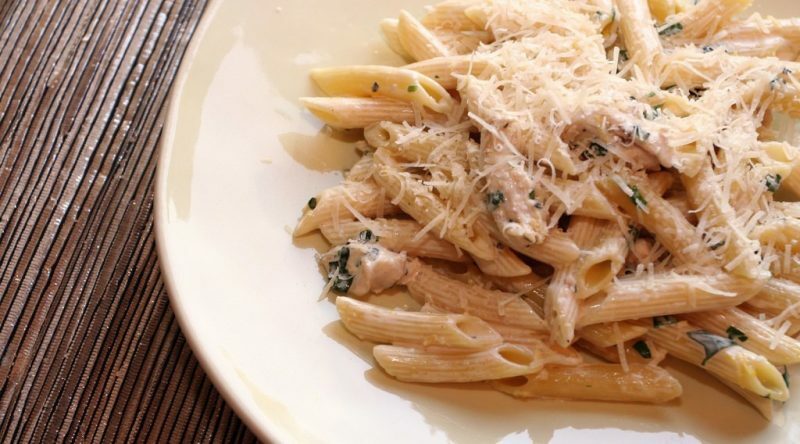 The cheese, spinach and protein can be added at the end, and you will find the heat from the penne melts the cheese and warms up the spinach and chicken or shrimp. Shredded fresh basil leaves make a nice garnish for this tasty dish. Penne pasta works very nicely but you could try linguine, spaghetti or another favourite kind of pasta when you make this. First cook the penne to al dente (tender but not too soft) following the instructions on the packet. Meanwhile you can sauté the garlic in the butter for 5 minutes or until it is brown. Keep stirring it all the time and don’t let it foam up a lot. Take the browned butter off the heat and stir in the matcha green tea powder. Drain the cooked penne well and put it back in the pot, then stir in the browned butter mixture and spinach. Now stir in the cheese and chicken or shrimp. If you find the penne sticks together too much, add a little water as well. Grind in some salt and black pepper and divide between 4 serving plates. Serve right away, garnished with fresh basil if liked.